BRAMPTON, Ont. — A mother, father and daughter died in a house fire Tuesday morning, while the couple's other daughter suffered severe burns when the flames and heavy smoke spread quickly through their home in Brampton, Ont. Firefighters were called to the semi-detached home near Dixie Road and Bovaird Drive East shortly after 4 a.m. 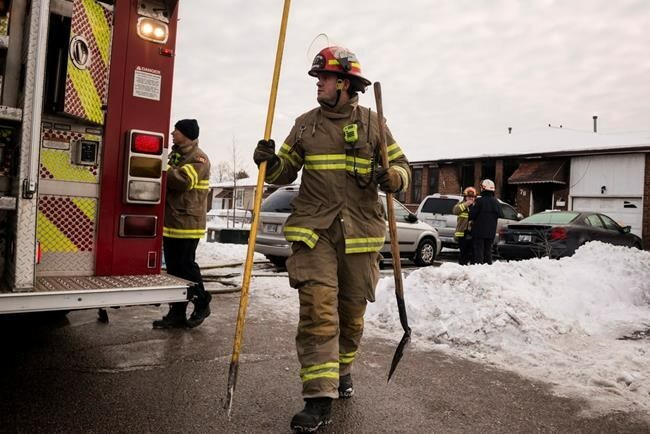 The city's fire chief said by the time firefighters arrived, a man in a basement apartment had kicked his way into the main level of the home and rescued the young girl. "The fire had already broken out through the front windows so they did a transitional attack through the front window and had the fire under control in approximately 10 minutes," said Fire Chief Michael Clark. "Two crews went down the side door into the basement, did a search of the basement and made their way upstairs and they found three bodies upstairs." By Tuesday afternoon, the Office of the Fire Marshal said seven people were believed to have been in the house at the time of the fire — three people in a basement apartment who escaped unharmed, and four people in the upper levels of the home. Authorities did not release the identities of the victims, saying they were still in the process of notifying next of kin. The fire is believed to have started in the living room on the main floor of the home, Clark said. "We have no idea what started the fire." The man who rescued the young girl returned to the scene of the fire Tuesday afternoon and told reporters he was alerted to the blaze by screams from people on the upper floors. "I went around to the front and kicked in the door and the whole house was pretty much completely engulfed in flames," said Sheldon Teague. He called out and then saw the little girl walking toward him. "She made it about halfway down the hallway, I believe, and then I could start to make out her legs so I just ran toward her, picked her up and brought her outside," said Teague. The child was bundled into the car of a woman — a newspaper courier — who happened to be on the street. "I saw the fire, I was delivering the paper and I caught her. I put her in my car," said the woman who didn't want to provide her name. "She was burnt. She wanted to know about her parents. She was crying." The child was rushed to a Toronto hospital with third-degree burns, police said. She was listed in serious but stable condition. The blaze left the home's facade marked with soot. Scorched interior walls could be seen through the front door and blackened drapes fluttered through an upstairs window. "I don't think the fire was actually that bad from a property perspective, certainly it involved a great portion of the main floor, but the smoke is the thing that obviously can kill people," said Clark. "Smoke spreads very quickly throughout a house." Police blocked off much of the street leading to the house but throughout the day people who knew the victims walked up to the barricade looking for information. Nicole Chevolleau started sobbing as she looked at the house, saying she was friends with the girl who had died in the fire. Chevolleau described her friend as a talented 18-year-old who had just started at the University of Guelph-Humber. "She was really smart and she was really sweet and so was her mom. They were just really nice people," she said. "I still can't even process it. I was in class when I found out and I left." Chevolleau said she also knew her friend's little sister, who she said was under the age of 10. "She was shy but she was a nice girl," Chevolleau said of the young girl. "Her mom was really nice...She cares a lot about her daughters and her daughters' friends, too." Tina Durnford, who lives in the area, said the young girl who survived had been in her son's class. "She was very sweet, very quiet, very friendly," she said. "They seemed like a very friendly family." The investigation into the fire is in its early stages. The incident was the latest in a string of deadly house fires in Ontario over the last few months. Four family members died in a fire in Port Colborne in mid-December. About 12 hours later, a fire ripped through a home on Oneida Nation of the Thames, killing four children and their father. On Christmas Eve, a mother, father and their two sons died in a blaze in a cottage near Peterborough, Ont. Two others died in a fire near Chatham-Kent in late January.